Organisations operating in sectors such as education, government and non-profit are facing a common commercial challenge. They need to answer the need for high speed print production at a low, controllable cost. 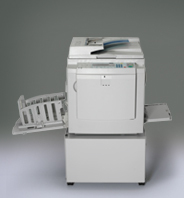 Using digital technology, the DX 3240 and DX 3440 duplicators from Rex-Rotary have been specifically designed to produce high quality document output. The DX 3240 and DX 3440 will add flexibility to your document production with versatile paper handling to fulfil a variety of single sheet output requirements. More print jobs can be accepted, production easily monitored and documents sorted for easy distribution throughout your organisation. Each model is easy to use, reliable and maintains its productive performance.